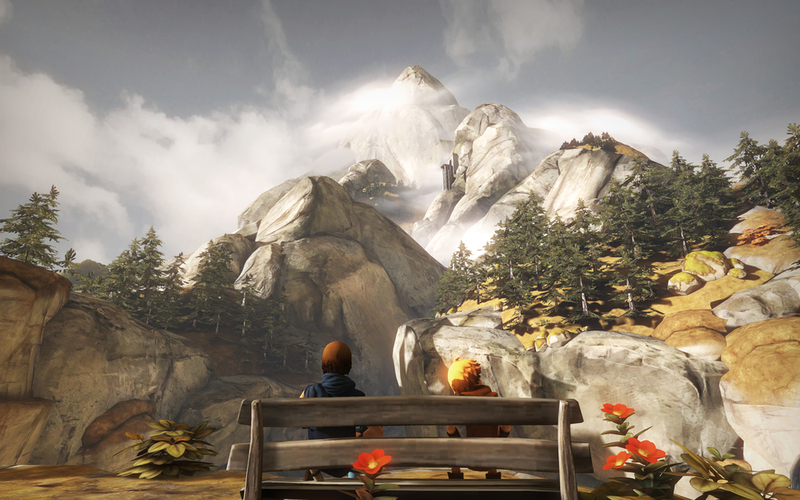 There’s a moment in Brothers: A Tale of Two Sons that reminded me why I love videogames. In fact, it left such a huge impact on me that I’m pretty sure that it’s the single best 10-15 seconds of any videogame. Ever. It’s a solo co-op game, with the left stick and trigger controlling the older brother, and the right stick and trigger controlling the younger. It requires some impressive brain gymnastics to get the hang of controlling two characters at once, both moving independently of each other and focused on completing different tasks. Games have trained us over the years to be excellent at controlling a single object, possibly with some subservient followers, probably because moving two figures at once, with no relation between their movements is hard. "Brothers is confident that it can teach you how to work as a team with yourself"
Beyond just videogames not training us for this, I’m pretty sure the human brain isn’t wired for this kind of job. People who have never played videogames before often have trouble working a first person shooter, since it requires the player to operate two axes of movement independently of each other. The abstract task of controlling even a single figure on a screen is too much for most people. Not to mention the fact that we’re terrible at multitasking in general, even when it’s something as simple as patting our heads and rubbing our bellies at once. So when it comes to controlling two characters at the same time, it’s not surprising that the majority of the first chunk of the game is spent making your characters run into walls and stumble around each other. But, Brothers is confident that it can teach you how to work as a team with yourself, and that confidence isn’t just bluster. As the game goes on, you get better and better at controlling the brothers, better and better at working in unison with yourself. It’s an impressive feat of game design, but what’s more impressive is how they tie it in to the narrative. Brothers tells its story with out a single word of dialog, at least not that anyone can understand. Characters speak a fantasy babble language that sounds vaguely like simlish. The only words I could make out by the end were (what I assume are) the names of the two brothers. It’s a simple story, two brothers go on a quest to find the water of life, which will save their dying father. The journey goes about as well as you’d expect for two children, with moments of triumph and wonder punctuated by loss and danger at every turn. It’s a story of love, brotherhood, and loss, but manages to get your to care about its characters without ever saying a single word to you. Not only that, but as you play the game, you get better and better at controlling the two brothers in unison, to the point where it becomes second nature. The game is teaching you how to do it through practice, but what it ends up looking like is that the journey these two brothers go on brings them closer and closer, until they don’t make mistakes, they know what the other is thinking, and they become a perfect team. It’s as if they share a brain. Of course, they do. It’s your brain they share. But there’s a little more to it. 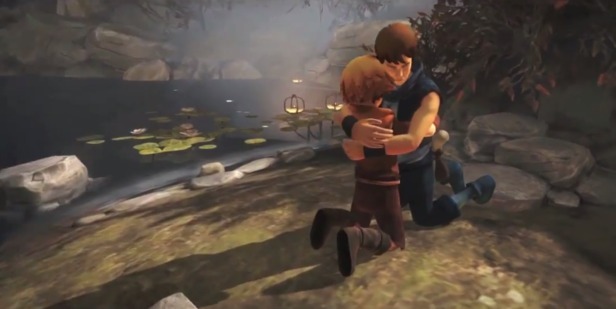 At the beginning of the game, there’s a cutscene which shows the younger brother on a boat, trying to save his mother from drowning. The scene ends with him woken up by the older brother, calling him away from their mother’s grave to help carry their father to someone who can help. Later on, you encounter water, and the younger brother refuses to go in. At first I thought it was because he couldn’t swim, but I realized very quickly it was because he was afraid of water, because he watched his mother drown, and the concept of being in water now terrified him. In order to get him to swim, the older brother has to enter, then the younger brother has to walk near him and grab his back. You hold down the right trigger to have the younger brother hold on, and then swim with the left stick. It’s a pretty simple action, all things considered, but it means something a little bigger. The younger brother relies on his elder, he’s useless without him, he needs him to help him get over his fears and contribute. It’s an extremely subtle moment of character development, and amazing that it’s told almost entirely through player interaction. Later in the game, the older brother dies. 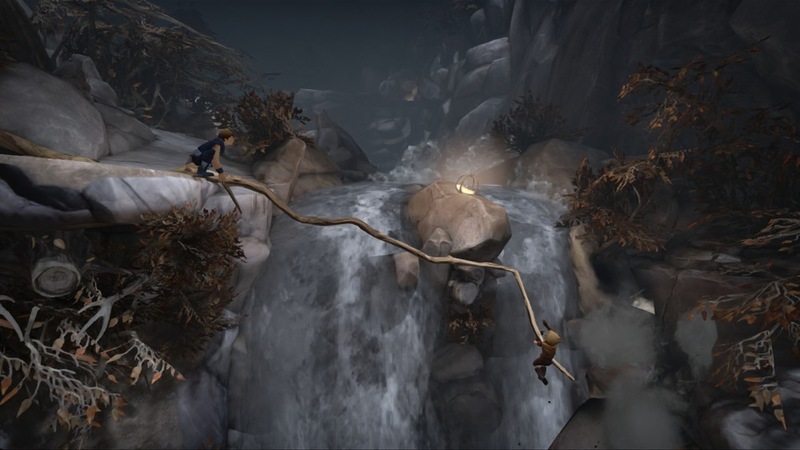 The brothers make it to the tree where the water of life is kept, but the older brother doesn’t hold out long enough for the younger can make it back with the water of life in time to save him. Thus, the younger brother, now the only brother, has to head back to save his father alone. On the way back, the younger brother comes across a river. Walking up to the river elicits the same reaction from the younger brother as it always did He shakes his head no and tries to turn away. He still refuses to walk into the water, no matter how many times you try to press his action button. Ever since the two brothers separated at the tree of life, the game only has you use the right stick and trigger, the buttons that once controlled the older brother are useless. But now, standing in front of the river, you realize that they do have a use. Pressing the left trigger, the older brother’s action button, makes the younger brother jump in the river and swim across as fast as he can. It’s stormy, the waters are choppy, but he swims across, crying the whole way. It doesn’t seem like much, I know, but it’s those ten seconds of swimming across a river that drove home every single one of the game’s themes. Every leg of the brother’s journey is about love and how it changes people. 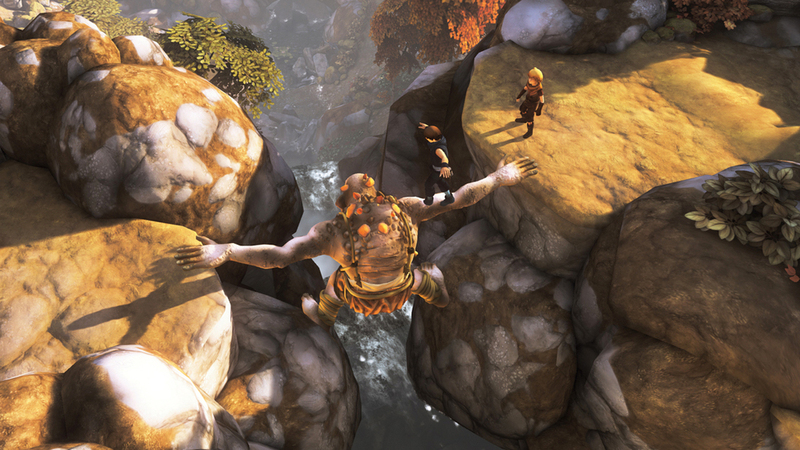 A troll helps you along your way, but then throws you into mines in order to save his beloved. You free another troll only for her to run away, forcing you to deal with her captors. She returns and offers her help, realizing you were sent by her husband. You free a strange-griffin like creature, which in return for your help, flies you across a chasm before dying, loving freedom until its last breath. The older brother falls for a girl you save, and stops listening to his younger brother, the person with which he essentially shares a soul. Ignoring his brother’s advice costs the older brother his life. His love for the girl made him ignore his love for his brother, and changed him for the worse. I could write essays upon essays about all of the individual thematic moments in Brothers, and why they’re all so spectacular. They’re all little parables, almost fable-like in how they express their themes without any dialog, just gameplay. "Hitting a button reminded me why I love videogames." In the end, pressing that trigger to make the younger brother swim is the final point the game has to make about brotherhood, love and loss. Love can make you stronger, it can change you, but it can also ruin you, in the case of the older brother. Loss can make you weak, and useless, like the younger brother who can’t even swim without help. But brotherhood is stronger than any of these forces, a permanent bond that ties two people together, through love, loss, death and anything else the world can throw at them. In ten seconds, the game throws all of that at you. With one button press, the game puts you in charge of putting the thematic conclusion on the entire game. Hitting a button reminded me why I love videogames. Why a medium that can affect you through your own interaction with a story is worthwhile. Why interactivity can enhance a story. Ten seconds reminded me that videogames can be amazing, and that makes them the best ten seconds of any videogame ever.